haunted ship – i swear to goth. for those that live forever in their goth phase. [Places] I’m on a (Haunted) Boat! Ahoy, there! 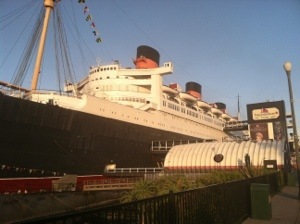 Blogging from an iPhone aboard the permanently docked and supposedly haunted Queen Mary in Long Beach, CA. So far, I have spotted no ghosts, but I did just arrive a mere 4 hours ago. There is an exercise room and spa, as well as a Tea Room that is currently exhibiting a Princess Diana display. Will be posting more, after I sleep! Tomorrow is Disneyland! Posted on September 18, 2013 September 18, 2013 Categories PlacesTags big boat, gothy vacations, haunted places, haunted ship, I'm on a boat, Long Beach, Queen MaryLeave a comment on [Places] I’m on a (Haunted) Boat!